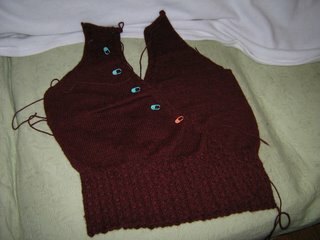 Ivy Knitalong: I'm getting there! Here's where I am. I finally finished the second front. The back and first front have been done for sometime now. This yarn is really amazing. It's the KnitPicks Andean Treasure in Embers. I just love how soft it is. I am going to start on the ties tomorrow while I am work. I figure it's more portable than the sleeve and requires less concentration. I am giving myself two weeks to finish. I really can't wait to wear this sweater. Meg, that is gorgeous! I love that dark red. I had the chance to fondle - err, sample a bit of that yarn when my sister use it and I was practically drooling. I bet a whole sweater with it will be the warmest, cosiest piece of clothing ever. I've come to the conclusion my living room is a tad too dark to do the color justice. When I'm done, I'll post some photos of the sweater in action. It really is awesome. It'll be soft and drapey. I really don't feel like it'll be to warm. I made the fairly easy fair isle from the 2nd SnB book with the bulky Lamb's Pride. I never thought I could wear that without roasting. I have high hopes for this one.